Our young volunteers are a vital part of Norwood’s workforce, giving their creativity, passion, time and energy to brightening the lives of the people we support. Over the autumn period, our heroic young volunteers packed and sorted donations, created gifts and decorations, and helped spread the festive cheer in our various services. 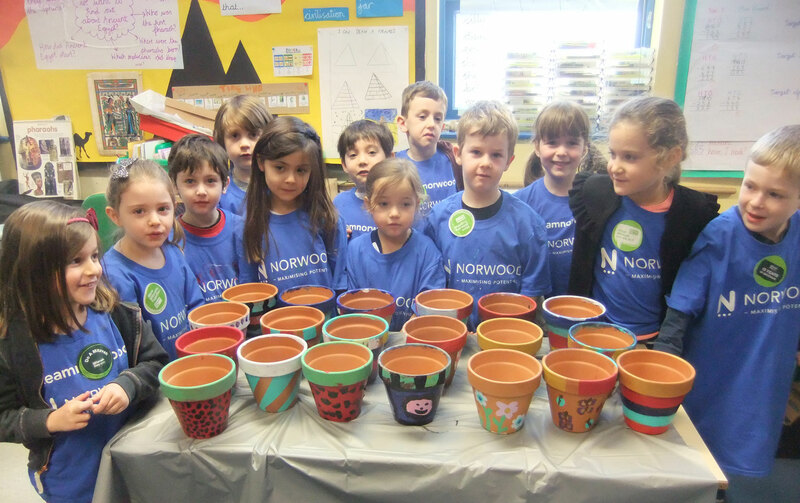 For Mitzvah Day, the Cheder chose to support Norwood for the second year running. Children aged 5-11from the Cheder spent the morning filling Chanukah jars with dreidels and chocolate coins, and sorting through clothing donations that they had collected for Norwood Charity Shops. The youngest children painted plant pots which they will plant at one of our homes with their parents in the summer when the weather is better. Others made greeting cards and created coasters from upcycled CDs which were given as gifts to the people we support. 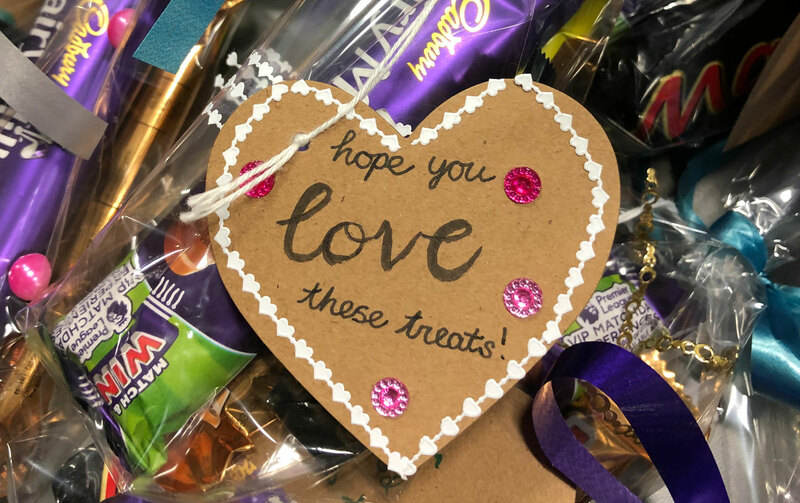 Parents and children collected donations of kosher, wrapped sweets and chocolates and healthy snacks to give to the people we support at Norwood for our Chanukah party. Year 1, 2 and 3 students worked on three separate days to pack all the donations and by the end, there were over three full bin bags of food donated. The children each made a decorated small gold or silver small cake box, filled with chocolate, with a small note where they wrote a lovely message to the people we support. They made over 100 filled boxes which were then given to the people we support at the Norwood Chanukah Party. Year 6 students all attended a training session to become a Young Ambassador to promote Norwood and the project, and gain leadership, teamwork and communication skills. They were very helpful in drumming up support for the donations, sorting the goodies out and helping the class with packing. Around 100 girls from Year 7 from South Hampstead High School gave up their lunch time to do some volunteering for Norwood. They gathered in the school hall to take part in a wrapathon organised by Norwood and Light Up a Life, a charity that arranges delivery of donated chocolates over the winter holidays to the people we support and our staff. The girls wrapped 500 bars of chocolate into over 150 packages. The chocolates were wrapped in cellophane bags that the girls enthusiastically decorated and tied with ribbon. They wrote lovely tags with warm and positive messages. These chocolates formed part of the delivery that Light Up a Life delivered to Norwood over the holidays. Four groups of JFS Year 12 students volunteered at two of Norwood’s care homes, Carlton Avenue and 159A Station Road, as part of their social action programme. The event was organised by Norwood and GIFT, an organisation inspiring the next generation to become givers through dynamic education and impactful volunteering. The groups came along to the homes, where the home managers delivered a great session about Norwood and their home, as well as teaching the students some Makaton, a language programme using signs and symbols to help people communicate. Some of the people we support also took part which was great. 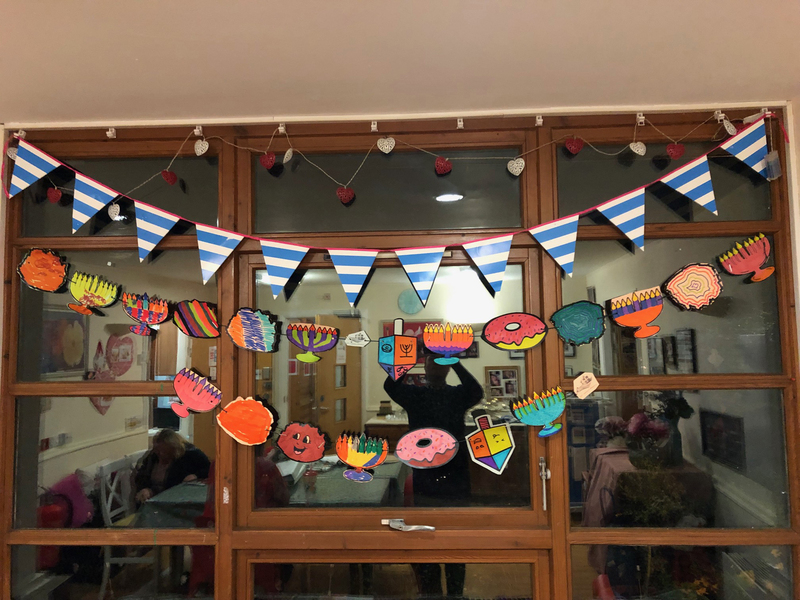 The students then made some Chanukah decorations and enjoyed tea, cake and doughnuts with the people we support, practising their Makaton and playing dreidl. Our Young People Volunteering Programme engages with schools, colleges, synagogues and youth groups across communities to give meaningful volunteering projects and experiences, helping young people gain a real insight into our life-changing work. If you know a young person who could be a great volunteer, please contact Ruth Korel on Ruth.Korel@norwood.org.uk.